The TIM Test System consists of three parts. 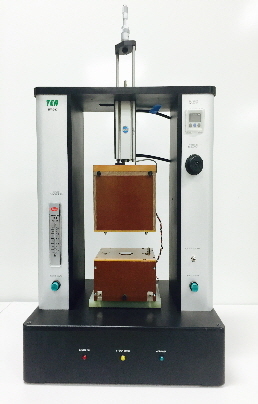 The Thermal Test Frame (TTF) apparatus is the mechanical portion that applies the pressure and provides the cold plate reference temperature. The Thermal Test Modules (TTMs), a top and bottom units that plug into the TTF, provide the heat flux to the test sample and contain the sensors for temperature measurement across the integral heat flux columns and across the test sample. The Heat Flux Instrumentation (HFI) box is a stand alone unit that contains measurement and heat flux-generation electronics and the computer interface. The software installed on the computer that accompanies the system drives the HFI and collects, displays and saves the data produced by the system. Measurements made in accordance with ASTM 5470. An air compressor and recirculating liquid coolant are optionally available.